A personalized 10th anniversary magazine cover is a unique gift that features a photo of the couple with custom headlines all about their life. It's a unique 10th anniversary gift that is sure to please. The celebration of a milestone 10th wedding anniversary should be done with a unique memento that shows how much you care. A YourCover personalized magazine cover offers the chance to give a 10th anniversary gift that’s as unique as the couple being celebrated. 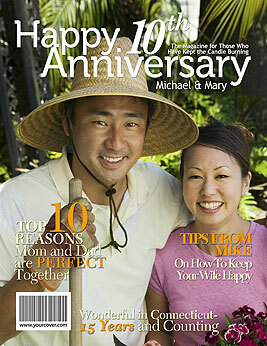 Upload a photo to the magazine cover generator, personalize the default headlines, add your own or choose from our library of suggestions to create a unique 10th anniversary gift that is all about the special couple. Much more than a fake magazine cover, a personalized magazine cover from YourCover is a gift from your heart that they’ll keep forever because you made it just for them. The unique back cover feature is available just in case you have a more photos and info than can fit on the front. Purchasing options provide you with a variety of choices so you can choose the fake magazine cover product that is most convenient for you – a photo file download for instant printing at home or a photo print that YourCover will produce and ship to you. A gift service as well as frames, and rush and international shipping are also available. A wonderful keepsake to commemorate a milestone anniversary, a YourCover personalized magazine cover is a unique 10th anniversary gift that will be recalled fondly for many years! Make a Fake Magazine Cover using the YourCover magazine cover generator.